This post is 2 weeks late. 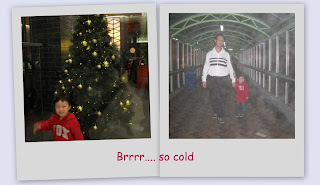 But because of my nagging cough, I wasn't in the mood for blogging. Finally, managed to organize the photos for posting. 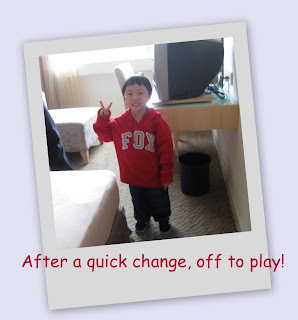 We left for our first overseas family holiday on 30th Nov, Monday. Baby G was pretty excited cause we kept telling him that we are going to take a plane. He's been looking forward to this for the entire week. He woke up without much fuss and we managed to get to the airport pretty early. 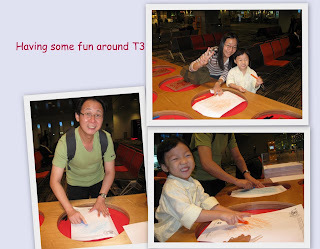 We immediately checked in so that we had time to roam around T1 & T3. We haven't been inside T3 since it opened so this is the best opportunity to do so. 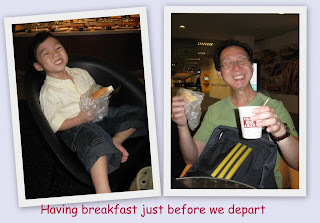 We stopped at Toast Box for breakfast. Look at how Baby G makes himself comfortable.... just took off his shoes and chill. 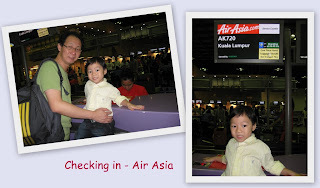 When we reached Malaysia via LCCT, we took the Skybus to KL Sentral to get our bus tickets to Genting. As we still had about an hour & a half before our bus came, we had our lunch at the food court @ KL Sentral. Food was so-so only. After that, we just walked around KL Sentral, waiting for time to pass. Baby G fell asleep while on the way up to Genting, but he woke up feeling excited again when he realised we were going to take the cable car. 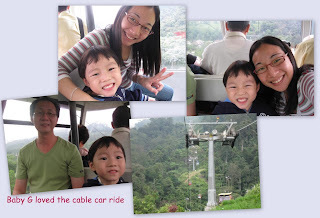 He's been missing the cable cars in S'pore and was very happy to see them again at Genting. 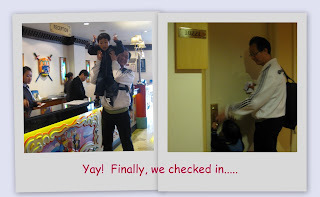 We stayed at Theme Park hotel. It's the 1st time we've been there and got lost while following the signs. We finally managed to reach our destination. 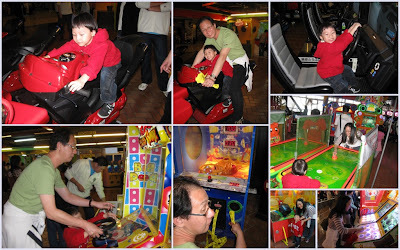 Our first stop was the Vision City indoor arcade games where we bought a RM50 card to play. As you can see, Baby G enjoyed himself so much. As usual, he loved the cars / motorbikes and wouldn't leave them. We just let Baby G sit at the 'racing cars' whilst he pretended to drive. I must say, he really looked pretty convincing as a driver. When the car on screen swerved, so did Baby G. Haha.. quite a funny sight. We continued to walk around the place and saw this Safari jeep. We asked Baby G if he wanted to take a ride in it on his own. Needless to say, he said 'yes'. 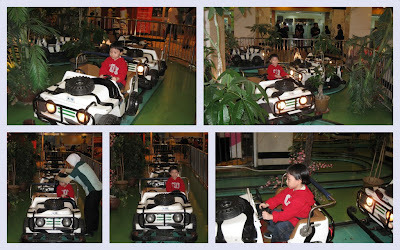 As he was first in the queue (actually, he's the only one in the queue), he got to ride in the first jeep. After that, as there were no one else, the attendant started the ride. Baby G was all alone. Actually, I was a bit worried that, in his excitement, he'll stand up and fall down. So I followed him around while the jeep went around the tracks. Guess my worry was unfounded. 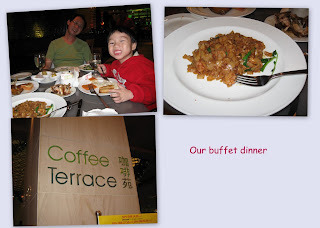 Good job, Baby G.
After all the fun & excitment, we stopped by for a scrumptous dinner. After the very filling dinner, we walked around. It was so cold. We did so many things that we decided to retire for the day so that we'd have more energy for the indoor and outdoor theme park. We were all pretty tired out and although we went to to our room, we didn't sleep. We still chatted with one another until Baby G fell asleep. so Fun!!! Im gg Up too! !